Wear your monogram in a flashy and fashionable way with the Engraved Monogram Bracelet with Tassel Charm. This perfect monogram bracelet is the ultimate arm candy. Everyone loves monogram jewelry and you can definitely be trendy with this perfect personalized accessory! 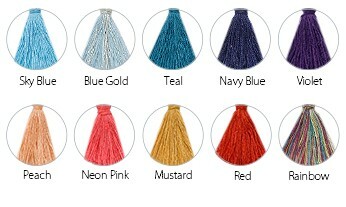 Choose up to three initials you would like as well as the color of the tassel charm. It is a fun bracelet for any special occasion and a personalized gift anyone would love to receive. This monogram tassel bracelet is made out of 0.925 Sterling Silver and hangs on a Sterling Silver Link Chain.